Channel 4's analog facilities are located on the second floor of their building, which was for obvious reasons the first building constructed at 350 Cedar St. (It is, obscurely, building number 6.) Entering the transmitter room, one is immediately facing this old RCA transmitter from the 1970s, which is maintained as a hot spare should anything happen to the new Harris which is the primary transmitter. I use the word ``hot'' advisedly: CBS engineering management places a high priority on maintaining broadcast operation at all times, such that even the two-minute warm-up time of this vacuum-tube-based transmitter is considered unacceptable. Thus, the heaters are kept running at all times, so that the transmitter may be started at any time simply by turning on the high-voltage supply. 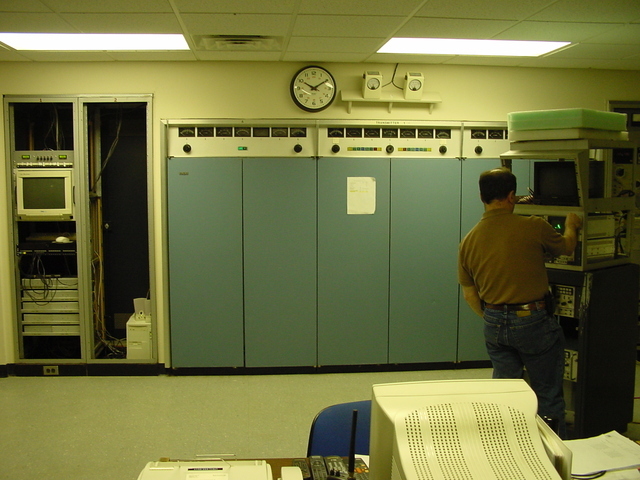 The rack at left contains control systems for both analog transmitters, the digital transmitter, the dummy load, and the antenna switching network. Facing this transmitter, to the right is the newish Harris primary, to the left are several racks of remote-control and STL equipment, and at one's back are this transmitter's processing racks.